WordPress or Magento: Which platform is better for e-commerce? 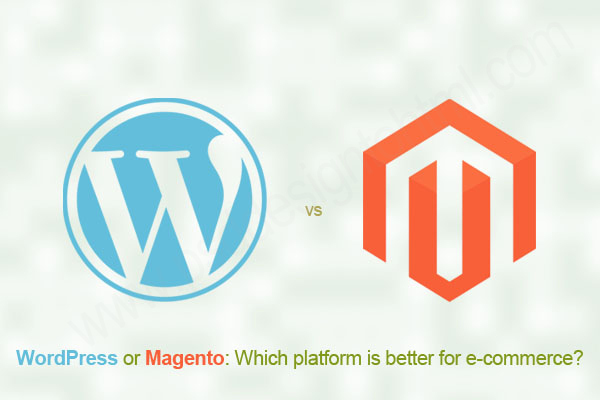 One of the current important topics of discussion is which platform is better for eCommerce – Magento or WordPress. There is no doubt that both of these platforms of content management are rich in standard features assisting in online based shopping websites for creating functional and high-end e-stores. It has been found that retailers are frequently confused when it comes to choosing an ideal platform while developing their online store. This piece of article is based on providing insights on whether to go for Magento or WordPress while selecting the Best Ecommerce Cms for Small Business. It is commonly known that WordPress CMS offers a number of plugins, along with eCommerce third party plugins. These plugins aid in integrating your web store into the WordPress theme – while you choose to change to WordPress from Magento. However, unfortunately the 3rd party plugins are not secured enough, and thus brings issues regarding its reliability, which is not a pretty good thing primarily if it is when you are going to sell products. On the other hand, Magento does not require plugins for the purpose of embedding features and functionality within the website, as it is mainly created for offering solutions for eCommerce. As a matter of fact, it is capable of adding better functionalities compared to the WordPress plugins. Besides, it is more secured than the WordPress plugins. It has built-in options of adding payment gateways, customized shopping ways, gift cards, and so on. Although, you can add these features in your wp store theme by employing plugins, but, at the cost of its security. Moreover, it would be time-consuming. In comparison to WordPress, Magento CMS is bigger and broken into deeper parts making it more difficult for operation. Thus, WordPress CMS is easier to handle. Nevertheless, an e-store with numerous products would be a cause of headache if WordPress is availed, making Magento more user-friendly. Multiples stores can be run with single dashboard using Magento enterprise edition. It is certainly a great feature of Magento over WordPress for whose business people who wish to expand their online business in future. Magento has flexibility over WordPress with a sophisticated backend of running several stores simultaneously. Hence, Magento has a steeper learning curve whereas WordPress has just an easy learning curve. Therefore, one would need more time to understand its entire architecture as well as manage the costs and products prior to launching the e-store. Time is the important investment that you ought to Time is the important investment that you ought to make in order to understand the complexity of the eCommerce platform. The Magento advanced e-commerce platform provides you with the ability of organizing as well as filtering products through its attributes. This platform is ideal for you if you have an e-store with numerous products having a number of variations. It will not only be handling it with much ease, but also give your clients a great flexibility while shopping. The complexity of the architecture is also a power if you consider the hosting requirements. Magento is definitely not some framework of publishing content. Therefore, if you are willing to link your WordPress blog with Magento site and efficiently manage the contents, then you would have to get some plugins installed while carving out a vivid strategy. Nevertheless, WordPress enables you to leverage your platform for creating a rich in content website with less efforts owing to the fact that WordPress is a user-friendly CMS offering to create plus publish blogs. Compared to WordPress, the extensions of Magento are usually more expensive. It has been seen that most often the costs for customizing the website is way over thousand dollars. The author is a Web Store Developer and a talented blogger currently working with psddesigntohtml.com focusing on psd to wordpress conversion. He has tried his best to enlighten new e-store businessmen to understand the differences between the e-commerce platforms of Magento and WordPress chalking out the pros and cons of both. The author wishes his insights are useful to the upcoming e-commerce website owners.